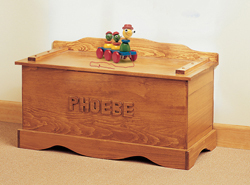 Besides being a handy way to store all of the toys that accumulate in your child’s room, or a frequently used living area, toy chests can become an heirloom that children and grandchildren can use and admire for many years. House Plans and More have several toy chest plans that provide significant storage space so your child’s toys are never far from reach, but are easily stowed away when entertaining. Our collection of toy chest plans includes many sizes and styles making it a fun do-it-yourself project that is easy for anyone. We offer detailed blueprints so you can follow the project directions easily throughout building. With a wide variety of designs, we are sure that you will find the perfect do-it-yourself project to fit your needs.